Even kids can enjoy this special interaction. La Jolla leopard sharks swim in relatively shallow warm waters near The Marine Room restaurant while foraging for food and, while skittish, often do not seem bothered by sharing the ocean here with respectful beachgoers. The best time of year for leopard shark viewing is between mid-June and December with peak numbers during July and August when they congregate by the thousands. If swimming with sharks sounds dangerous, rest assured that it’s not. I just learned that there has never been a report of anyone being bitten by a leopard shark. La Jolla’s leopard sharks are almost all female, most of which are pregnant. Their gestation period is 10-11 months. They bear live young, and a litter will typically consist of 15-20 babies. 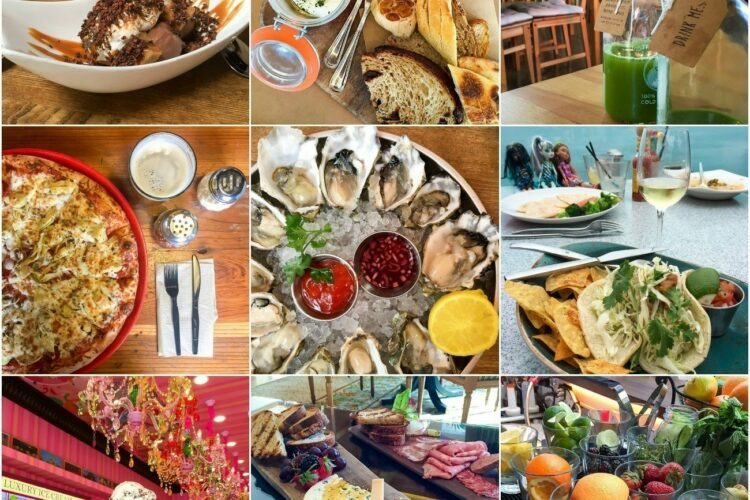 They congregate at La Jolla Shores because of its calm, warm, shallow waters—an ideal natural incubator—and abundant food in the sand, rocky reefs and kelp forest of the protected preserve, including clams, crabs, shrimp, squid, fish and fish eggs. The sharks’ distinctive color pattern, resembling leopard spots, is so varied that they can be used to identify individuals, akin to fingerprints. Leopard sharks live along the Pacific coast of North America from Washington to Mazatlà¡n, Mexico, including the Gulf of California. They arrive at La Jolla’s shores as early as June and as late as December, peaking in August and September. Leopard sharks have small mouths and teeth, perfect for feedings on crustaceans and bony fish. Adults can grow up to six feet in length, but the average size is four to five feet. 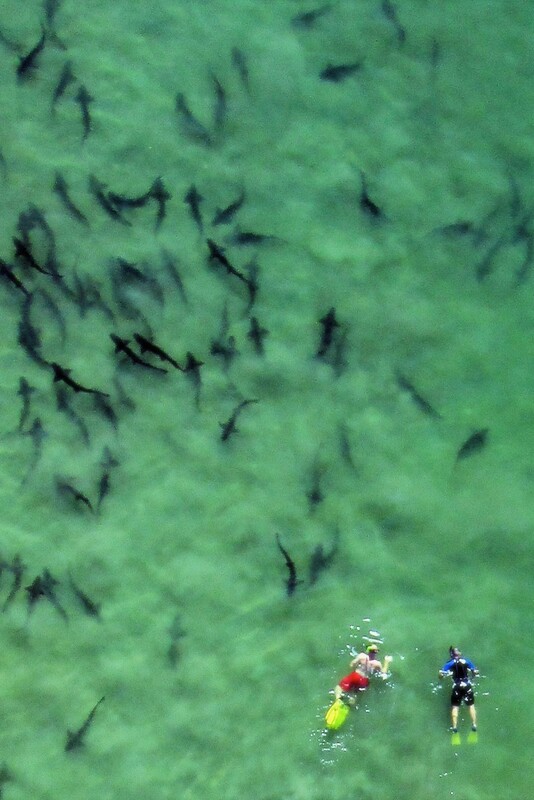 It is entirely possible to enjoy a La Jolla leopard shark encounter in knee-deep water during peak season. I personally think having a snorkel mask on hand even in shallow water is a great idea in case you want to put your face in the water and check them out that way. Relax and enjoy them. This is on my to-do list as everything the Birch Aquarium at Scripps, La Jolla’s prominent aquatic research facility and museum, coordinates is top notch. From July through September they host two-hour Leopard Shark Snorkeling Adventures which also cover the abundant variety of animals that make their home in La Jolla’s waters. Participants must supply their own snorkeling gear. Snorkeling tip: Floating on top of the water it the best way to enjoy the leopard sharks. They are skittish and easily frightened by kicking. Hike Bike Kayak offers 90-minute La Jolla Shores Leopard Shark Snorkel tours with naturalist guides from late spring through early fall. Snorkeling gear is included. 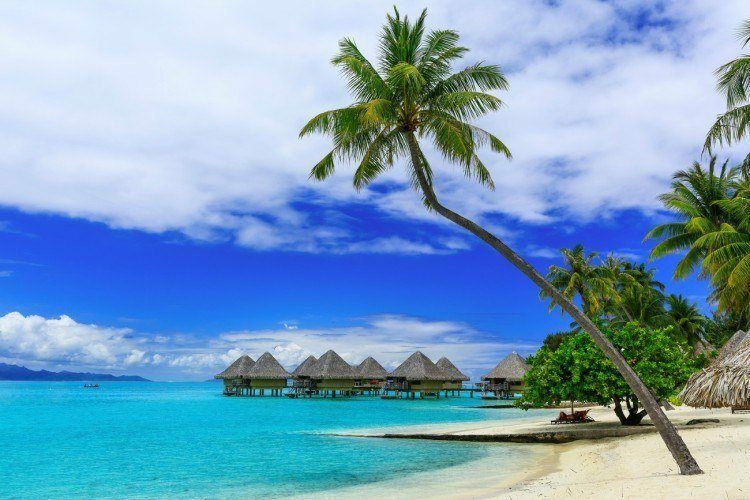 Guests not only swim with the sharks but also get to explore sandy flats and sand dollar beds while looking for rays and shovelnose guitarfish, as well as swim over kelp reefs to spot colorful fish, lobster and the occasional green sea turtle. Offered year-round, La Jolla Kayak‘s three-hour Leopard Shark Snorkel Tour includes one hour with a guide who will point out the best spots to view the sharks and two additional hours for guests to continue exploring on their own. Snorkeling gear is provided. 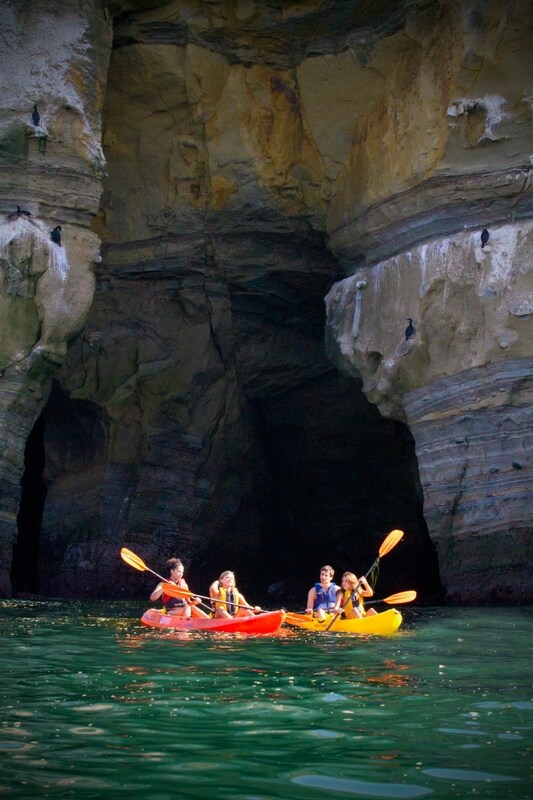 From March through October, Bike & Kayak Tours-La Jolla offers a 50-minute Leopard Shark Snorkel Adventure (snorkeling gear provided) and a 2.5-hour combined Kayak and Leopard Shark Snorkel Tour which includes kayaking to La Jolla’s seven sea caves and kelp beds (the sharks are easily visible from the surface of the water), plus snorkeling with leopard sharks, bright orange garibaldi fish, shovelnose guitarfish and other marine life. 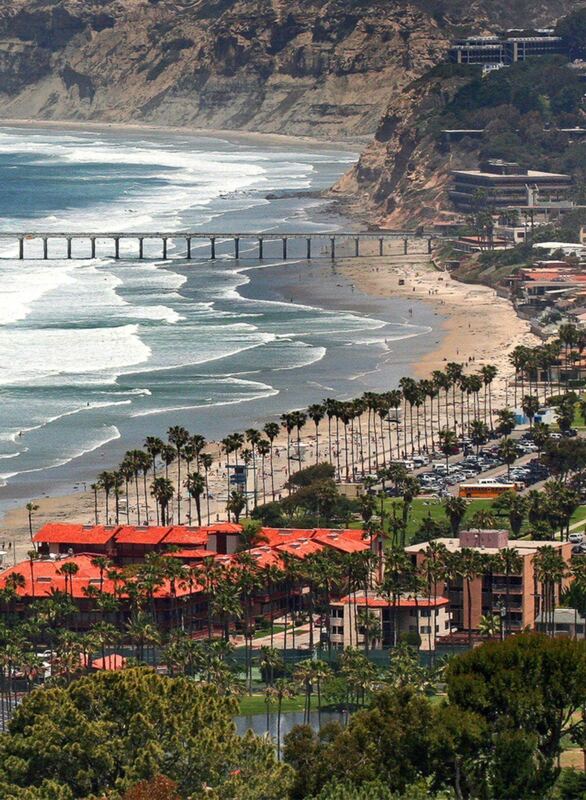 These two La Jolla hotels are ideal for those coming to experience the leopard sharks as well as the shops and restaurants in the beautiful La Jolla Shores area within walking distance. Located on one of our state’s few remaining private beaches, La Jolla Beach and Tennis Club offers 90 guest rooms including one, two and three bedrooms beachfront suites. 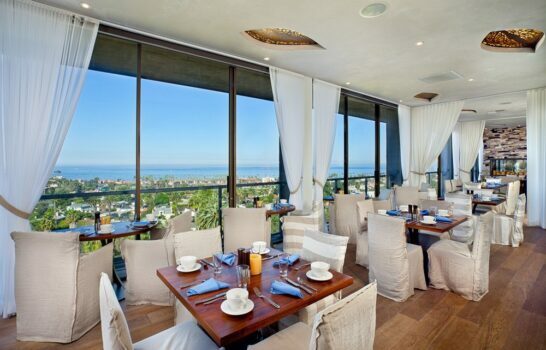 Other amenities include championship tennis courts, a nine-hole, par three golf course, massage services and world-class dining at the landmark Marine Room restaurant. Located next door to the La Jolla Beach and Tennis Club, the La Jolla Shores Hotel is the other beachfront La Jolla hotel option. 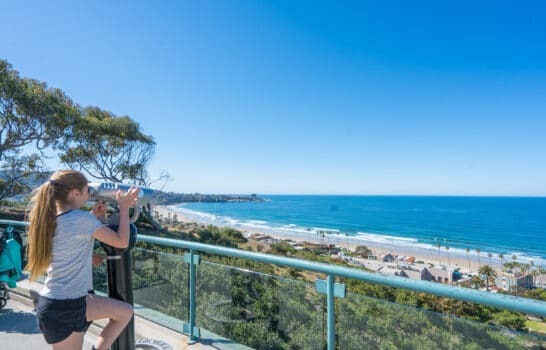 With 128 rooms, a small pool, available beach gear like chairs and umbrellas as well as the fantastic Shores Restaurant (an excellent place to watch the sunset), this is one of my family-friendly hotels in San Diego. For more information about planning San Diego vacation, definitely check out SanDiego.org. 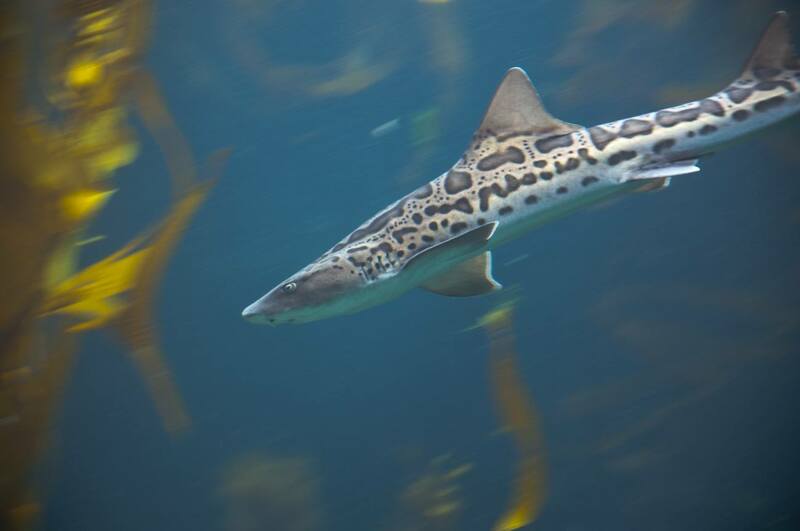 How do you like to experience the La Jolla leopard sharks? What a totally informative article! The animals are so interesting, and it’s great to be able to see them so many different ways, to fit with your comfort level. When is the best time to view in the water, low or high tide? I regret I don’t know the answer off the top of my head. I’ll ask around. It is always better when there are less people in the water so we tend to go in the morning regardless. Just went today at 4pm and did not see sharks. Some people on the beach said they saw a few early. Lifeguard said there are good and bad days. Will try the morning next week.